It's a FREE interactive BIG truck experience for kids and families of all ages! Highlands' parking lot will be full of amazing machines that kids can touch, tour and even operate: fire trucks, police cars, construction vehicles, tour buses, 18-wheelers, garbage trucks, giant tow trucks, and many more! Other fun awaits on the Highlands campus including bounce houses, a petting zoo, music and more. Food will be available for purchase from food trucks including Grilled Addiction, Twisted Cheese, a hot dog cart, and snacks like kettle corn and an ice cream truck. 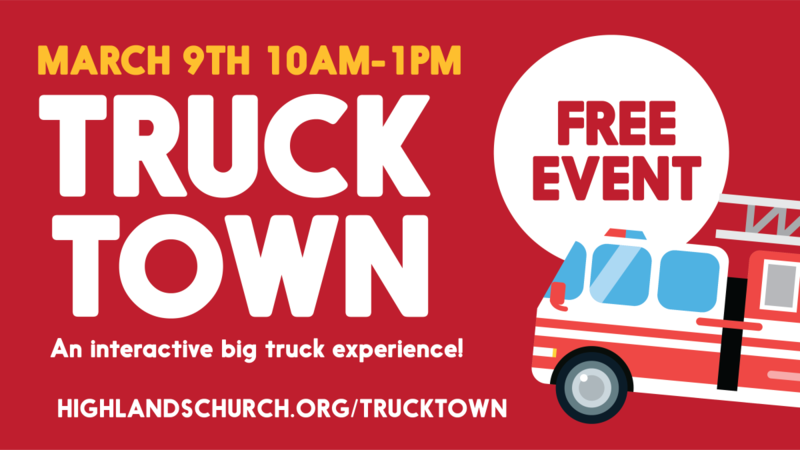 The event is FREE and open to the public - bring your kids, invite their friends, and enjoy the morning at Truck Town! Your free ticket will be sent via email and includes entry onto the campus, a single entry in the drawing for a 6-person desert outing with Carefree Adventures Jeep Tours, and access to additional activities including the Pinewood Derby, and other free activities. Download a full event map here detailing the locations of trucks, games, food and more! The Truck Town event will also benefit foster families through our partners at Christian Family Care. Truck Town attendees are encouraged to bring a Walmart or Target gift card of any amount to help foster families and children in need. If you call Highlands home, help make this an awesome community outreach for all who attend. Be a friendly face in the parking lot, help with bounce houses, be a 'truck host' and more!